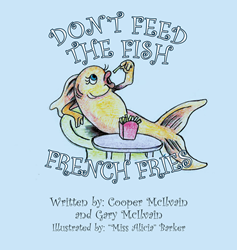 Recent release “Don’t Feed the Fish French Fries” from Page Publishing authors Cooper Mcilvain and Gary Mcilvain is a heartwarming short story about Cooper during his kindergarten year of school and the goldfish he won in a game he played in his first experience of being in a fall festival. Cooper Mcilvain and Gary Mcilvain, an eight-year-old boy who is going into the second grade and his father who works in higher education and ministers to the youth, have completed their new book “Don’t Feed the Fish French Fries”: a fun-filled story about Cooper’s experience in his first school carnival coupled with his friends in Kindergarten and how he takes care of the goldfish he has received upon winning the game. Authors Cooper and Gary Mcilvain write on the festive events that transpired in the carnival: “It all started when I saw a goldfish at the school carnival. But first I went on a hay ride with my friend James. It was outside, and we were pulled on a four-wheeler. And it went fast! Then I remembered about the cup-and-ball game where if you throw a ball and it goes in a cup, YOU WIN A GOLD FISH! Published by New York City-based Page Publishing, Cooper Mcilvain and Gary Mcilvain’s captivating short story is not just about Cooper’s fun adventure in the school carnival, but also about learning how to feed and take care of a gold fish through his parents’ guidance—french fries are not a main dish for a gold fish! Readers who wish to experience this awesome work can purchase “Don’t Feed the Fish French Fries” at bookstores everywhere, or online at the Apple iTunes store, Amazon, Google Play, or Barnes and Noble.